My weekend at the mighty Mighty Summit! 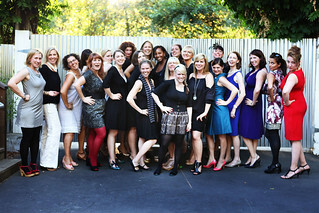 For the last few years, I’ve been hearing about the amazing women invited to Mighty Summit. Started by my friend, Maggie Mason, and the first few co-produced by my girlfriends Aubrey and Helen Jane; many of my other girlfriends had gone in years past, and all had raved at what an amazing time they’d had. The photos looked divine, as spending time in wine country, connecting with other driven, creative and talented women is pretty much my idea of a dream getaway. Lucky for me, this year I received an invitation of my own! I really had no idea what to expect, but I knew anything Maggie was behind would be nothing short of incredible. (No surprise, but it actually exceeded my expectations!) I was looking forward to meeting all the women whose names and faces I didn’t recognize, and was overjoyed to spend time with the few girlfriends I already knew. I was happy to see that Rachel Cole — who I had met through Twitter and in person at Teahouse Studio — had also been invited, as we had been meaning to schedule some one-on-one time. Therefore, carpooling up together was perfect! She is such a neat woman, and we had no shortage of things to talk about. I absolutely LOVE the work she’s doing, and I hope we get the opportunity to do something together at some point. Arriving at Boon Hotel & Spa, we were greeted by the happiest and sweetest dogs, Boon and Paris… so cute! Saying hello to Maggie, Rachel & I found out we were also assigned to room together, too — perfect! Oh, and our welcome packet was a cool MixedBag black & gray laptop sleeve, with a folder that contained a print out of all the girl’s life lists. The first of many gifts to come! Friday night we had margaritas and all-you-can-eat off of our very own taco truck, pulled right up on the lot. ¡Arriba! The big surprise though was when we all were given the most amazing gift bags [photo] I’ve ever seen in my life! The “gift bag” themselves being beautiful Epiphanie bags, which are gorgeous leather purses made to fit & protect SLR cameras! The designer and founder, Maile Wilson, was with us all weekend, too, and I really enjoyed talking to her about her business. Tieks: Super stylish fold up flats that are so comfortable! They had gotten our shoe sizes beforehand, too, so we could all slip them on right away. Amazing. Mine are ‘merlot‘ (perfect for wine country), and they’re so comfortable; I can’t wait to buy myself a second pair in a different color. They also included a personalized note, all about who I am and wishing me well for my life list goals [see photo]. It felt like they knew me! Photojojo iPhone lenses: 1 wide angle/macro & 1 fisheye — I’d been wanting these! Tattly tattoos: a whole little pack of awesome ones… I’d been wanting some of these, too! Typekit not only gave us free subscriptions, but they’d gone to the trouble to find real-life letters representing one of our initials. You can see my brass ‘O’ for O’Brien in the photo below. Gretchen Rubin’s bestseller, The Happiness Project. Gretchen herself was there with us for the weekend, too… double treat! I can’t wait to read it. feistyelle bamboo dahlia necklace – gorgeous! feistyelle (Leslie Yang) has been a long time friend of mine, is now a client and has long since been one of my favorite jewelry designers (I have 3 pairs of her earrings I wear all time time! See my post about her here.). Needless to say, I was delighted to hear she was contributing and that I may receive another one of her beautiful, eco-friendly pieces. She wrapped all the boxes in meaningful quotes [photo], and it was such a delight to see the ladies donning their new feistyelle necklaces the rest of the weekend. Helen Jane was even wearing a different one that she received at last year’s Summit! Visit feistyelle.com & see her beautiful felt earrings, too! 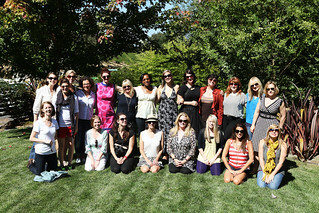 Saturday morning we enjoyed pajama breakfast by the pool, and then got ourselves together for a day of wine tasting. First stop: Moshin Winery, where we got to tour their biodynamic, gravity flow winemaking facility and learn about the process. 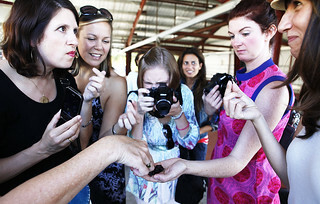 We even got to taste some grapes right out of the settling tanks (photo)! Then came the wine, and I fell in love with their Sauvignon Blanc, and bought myself a bottle before we left. After that we went for another tasting at Arista Winery, where we were served a delicious lunch from Big Bottom Market (same owners as Boon Winery, Hotel & Spa), and sat at picnic tables in the sun, looking out over vineyards for miles. Our last stop wine tasting was Hop Kiln, where Helen Jane guided us through a cheese-tasting, ala Cheesewizzes. I’m 90% Vegan these days, but I had a teeny nibble. That girl knows her cheese! By this time we were all tipsy, happy and tired. Going back to Boon, we got some down time, which for many of us meant more wine and playing in the pool… this is the life! 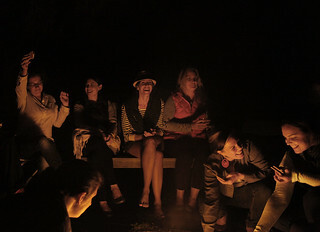 Then, Saturday evening was pizza, salad, and roasting s’mores [photo] around the fire, replete with Bailey’s — my favorite! Sunday morning we took a wonderful hike through the Redwoods, and I really enjoyed getting to know some of the ladies more. Women are so incredibly wise and resilient; I have mad respect. Lunch on Sunday started with a wine tasting (of course) at Thomas George Vineyards, after which we drove up to a sweet lunch spot under a canopy of trees, where we finally broke out our Mighty Life Lists; the denouement! Technically Mighty Life Lists are to be 100 things you want to do before you go, but I think mine is only around 50 or so, so far. However, no matter how many you had, at lunch we were asked to choose 5 things from our lists we wanted to accomplish in the next year. Eep! Looking at my big list, could I commit to doing 5 of them in the next year? And what would that look like? I would have to start planning now! It was an interesting exercise, and I was grateful for the push to have to get clear (it wasn’t easy). Listening to everyone else’s top 5 was fantastic, too. Such fierce, fabulous women!! That afternoon we did more playing in the pool and lounging around, some diving into helping others with something from their top 5. I had a lovely time chatting with Gretchen about family, traveling and the gift in moving our bodies. Then it was time for dinner! We all dressed up for this one, and were treated to a 5-star pre-fix dinner at Applewood Inn. All 24 of us, laughing and joyous around a long table; relaxed, happy and amongst new friends, it was the perfect end to a weekend of luxury and pampering. I was happy to sit next to Pamela Ribon, an accomplished author from LA, who wins Funniest Lady at the Summit — she’s awesome. That night at dinner we had one last sweet surprise… we were all given quintet gold necklaces from Lemonade Handmade, in honor of our 5 things we plan to do the next year. Aww, Maggie… what a brilliant finishing touch! I was completely amazed and in awe of the level of detail and care put into every part of our weekend, while simultaneously feeling like it was rather unstructured and relaxing. Can you tell we’re all bloggers? 🙂 The only ladies I couldn’t find posts from are Gretchen Rubin, Victoria Grand (love this photo of us), Isabel Kallman, Kirsten Grove, and the organizers/photographers (Laura, Susan, Libby, Maile). It was an absolute treat meeting and getting to know all of you mighty ladies!